Welcome to webinARTs 2016. If you are an artist who would like to sell more paintings and “earn more red dots”, then you have come to the right place. With the recent surge in art sales on the Internet, there is a huge opportunity for artists to sell their art online. The only challenge for artists is to learn how to do this. 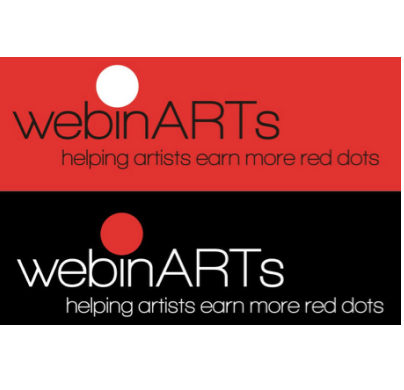 WebinARTs is an online course featuring video demonstrations and step by step written instructions to create your own art website and blog. The website is built using weebly which is a state-of-the-art web builder. For over six years, I've shared thousands of art marketing ideas on my weekly Artists Helping Artists blogtalk radio show. However, a lot of our listeners need more help implementing all of these ideas. And artists from all over the world are seeking to learn and excel at marketing their art. The 2016 webinARTs course will teach you how to create a website and blog. You will learn how to build a store on your site which automatically adds buy now buttons to your website. You will learn how to add as many pages to your website as you want. I will show you how to add movies, build a blog and create a mailing list. You will even learn how to add a survey and online form to your site. You will also learn how to utilize links and analytics that will enable you to see exactly how many visitors you have to your site every day. ​I use a website builder called weebly which offers fabulous templates, very easy and intuitive elements and is very inexpensive! Nowhere else is there a place to go to learn step by step exactly how to gain control of marketing your art. Click the link to the right for more information on weebly. But what if you are already have a website? First, you have to ask if you are 100% happy with your site. Also, can and do you update it yourself? In this webinARTs course you will also learn how to do everything yourself. We will create jpeg files (pictures) that feature your artwork that can be used as links on your website and social media. Then you will learn how to add these to your website and blog. You will learn how add on-line demos/movies to your website. You’ll learn how to create slideshows, a contact or rsvp form, add buttons with links, and even create a forum which allows your visitors to add topics and comments. Plus you will learn how to add a map to any location. This works great for studio shows or workshops! And if you are not too computer savvy then you will learn the basics to create a website. You don't need the bells and whistles. All you need is a nice looking and easy to navigate website that shows off your art. What if you already have a weebly website? ​It probably needs updating. The new weebly format creates "products" for every painting on your site. So you only have to enter the information for your painting once and then you can add it anywhere on your site or blog. If you haven't already created a store with "products" then you must take this class! Plus, the new features in weebly4 are fabulous. You can add sections to your website, add video in headers and use any of the brand new templates. In this class the first thing I teach you is how to upgrade your template. ​One of the most exciting features of this class is you will be part of a private webinARTs forum that allows you to ask questions, share your site and gain feedback from other webinARTs participants. The entire webinARTs course costs only $199.00. And you will have access to the class until December 2018. The entire course was designed using the new weebly4 platform which was released in late September 2016. *Once you register you will receive an email link to the private webinars website.